Here you will find an array of decorative items which can be used to make a home a home. Add personality to your room decor with this delightful range of Leeds Pottery Decorative Accessories. Starting with hand decoration, this type of pottery is notoriously difficult requiring hours of meticulous work often finishing in the scrap bin much to the tears of the maker. The beautiful range of Hand Decorated Plates stands testament to this, where the range of flowered works are all hand painted with the artists initials on the back and are beautiful examples of this pottery art. In addition, the beautifully crafted Floral Hand Painted Wares are very worthwhile additions to most collections, adding a touch of exclusivity to already splendid ware. Other Decorated Plates are no less arduous to make to the high standards of the Leeds Pottery potters. For instance Cake Stands are a particularly elegant way of serving and presenting cakes and delicacies and are included here on this fine selection of Leeds Pottery, but if you do not see what you like any design of plate can be used for your Cake Stand. The plate is delicately drilled to take the metal plate support stem meaning you can make your own unique design and size. The Leeds Pottery Ewer and Basin set is a reproduction of a set that would have graced a ladies boudoir or lady's private bedroom in Victorian times along with the Soap Tray and Shell Dish perhaps even a Shaving Mug ‘if the husband was allowed in’! Plus it makes a really beautiful stand alone centrepiece to a decorative display. The range of Leeds Pottery Candlesticks & Candle Holders will add style and elegance to your home setting. The sweet smell of scented candles in a simple but stylish Candle Burner can add to a romantic bath, and a set of Dolphin Candlesticks can be yours to raise the profile of your bathroom or washstand . A capital way to finish the day is to lie in bed with the aroma of incense being washed over you from fragrant oils being burnt in the Incense Burner & Stand. And your dressing table scene would undoubtedly be enhanced by a pair of Pierced Candlesticks or Round Pierced Candlesticks or the delicate but beautiful un-pierced Tulip Candle Holder or Pierced Tulip Candle Holder. What sideboard, mantelpiece or dresser would not look better with the addition of the bold and striking Square Candlestick or Round Candlesticks? The Openwork Ornaments style of piercing gives more of a delicate look and the variations of the Openwork plates on the Cake Stand demonstrate this well. The Open Work Jar along with the Pot Pourri has a multitude of decorative uses. For dinner table accessories unusual settings pieces include the Open Work Cruet Set or the Open Work Oil and Vinegar Set. 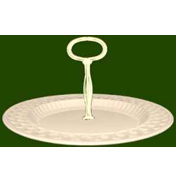 The Open Work Napkin Ring, Open Work Wine Coaster and even Egg Cup work well too in creating an elegant table setting. The designs in the Leeds Pottery Baskets range have shown the test of time with items from the simple 3 ¼” Plain Basket and inexpensive 3 1/4 inch Basket with or without handle, or the larger 6 1/4 inch Basket. More intricate designs include the Cherry Basket which can be tried in combination with the Small Pierced Plate and the Daisy Basket and Fruit Basket and Plate are truly beautiful. These along with the Pierced Lattice Basket & Plate, Strawberry Basket and Strawberry Basket Plate have all got their place in museums and historical books. Finally, the Leeds Pottery Animal Instinct pottery range adds a quirky style to the creamware glaze with its African safari style jungle glade stripe camouflage decoration designed to add a little adventure to the kitchen table. Grrrrrrr! So when you need to look for an elegant Decorative Accessory then look no further.